Ocean tide gauges have been used for more than a century to measure sea surface height at specific locations around the globe. Today, scientists combine data from ocean tide gauges with global observations of sea surface height from satellite radar altimeters to detect patterns and monitor changes in ocean height. Currently, NASA’s OSTM/Jason-2 mission—a continuation of the TOPEX/Poseidon and Jason missions—measures the height of the sea surface with an accuracy of about 3 centimeters (just over 1 inch) relative to the center of the Earth. These highly accurate measurements of the height of the sea surface (commonly called “sea level”) are needed to provide long-term information about the world's ocean and its currents. In this visualization, sea surface height anomalies derived from ocean tide gauge data (before 1992) and satellite altimeter data (after 1992) show differences above and below normally observed sea surface heights from 1950 to 2009. These data help show how much heat is stored in the ocean. 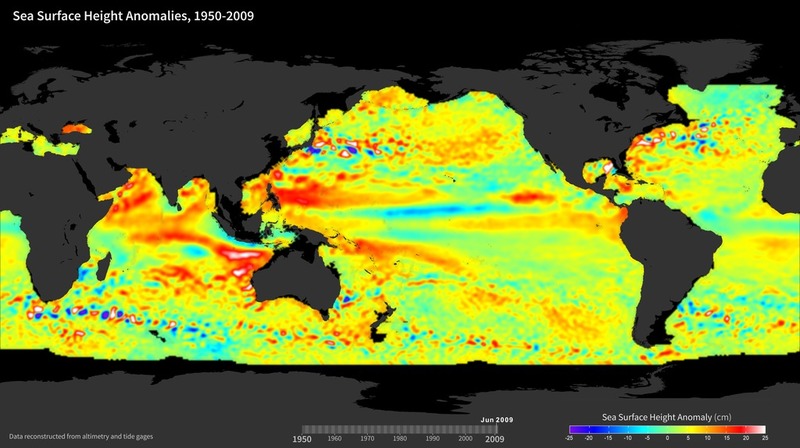 For example, El Niño events (characterized by warm water and high sea surface height anomalies in the Eastern Pacific) are visible in 1957, 1965, 1972, 1982, 1987, and 1997 along the Equator. Sea surface height data also have many other applications, such as in fisheries management, navigation, and offshore operations.